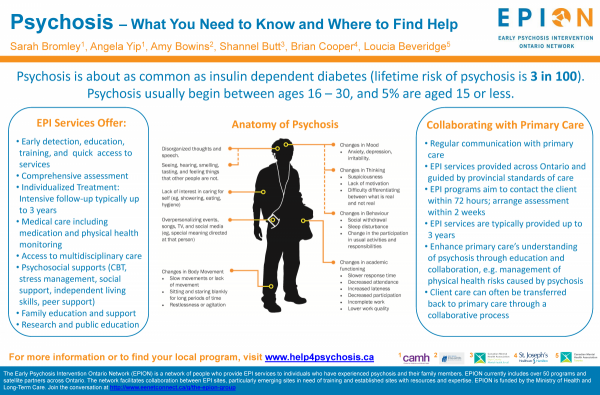 The Early Psychosis Intervention Ontario Network (EPION) community of interest recently presented a poster presentation at the Association of Family Health Teams of Ontario (AFHTO) 2016 Conference, “Leading primary care to strengthen a population-focused health system”. The conference took place at the Westin Harbour Castle, One Harbour Square, Toronto, Ontario on Monday, October 17 and Tuesday, October 18, 2016. Check out the presentation titled ‘Psychosis – What You Need to Know and Where to Find Help’.